I'm ready to get my pillows out but it's been a little rainy, so I think I'll wait. 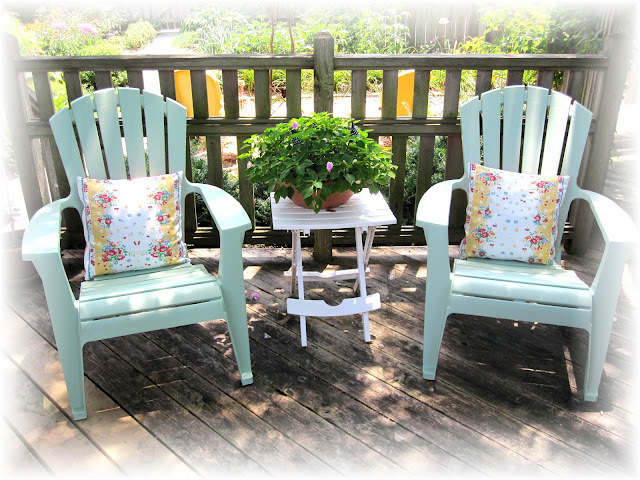 Have you gotten your pretty porch pillows out yet or made new ones? I'm linking up this post with Vee's Notecard Party. 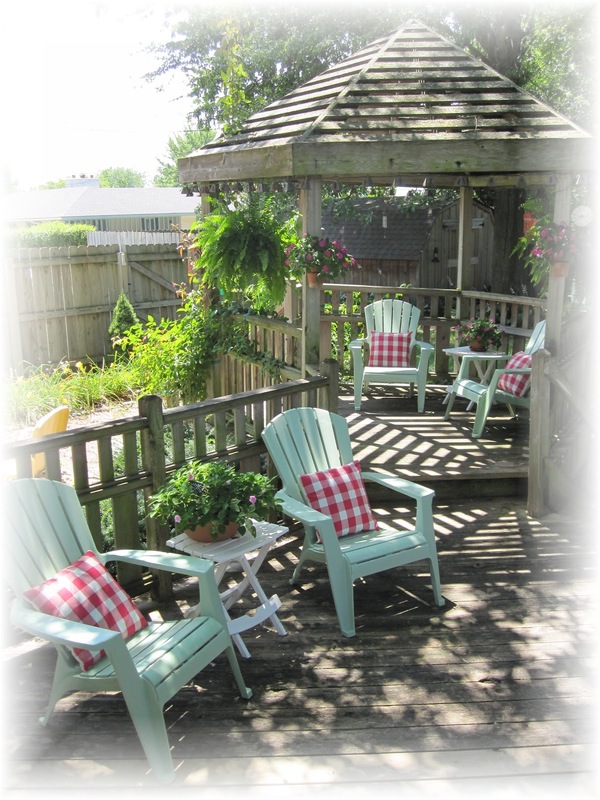 Your photos remind me of a lovely little oceanside B&B with a private garden to escape the hustle and bustle of the boardwalk and relax, exhale and sip a beverage (I'm not specifying what type of beverage!). My porch has been cleaned but no pillows out yet because the pollen just.won't.stop! In fact the porch will need another light cleaning before we can actually use it. Enjoyed your photos. Oh this would make the most charming set of note cards. Love the colors of those chairs with whatever side of the pillow you're showing. That's a great switch! Thanks for participating! When you said your pix weren't so good, first thing I thought was, "well, look. she can do stuff with the edges. that's good." More than I can do! 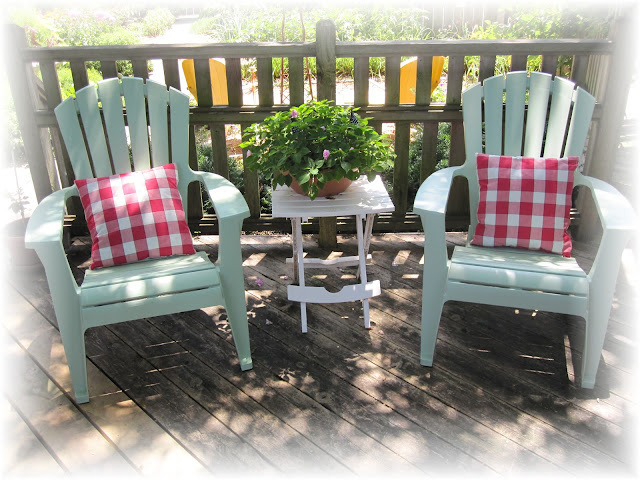 What a restful and inviting place! I love your chairs and pillows....It looks like the best place to have an ice tea and read a good book! Oh that looks like such a peaceful spot to relax and read a book- nice choices! These are definitely worthy! I love the color of your chairs, the pretty pillows, the comfortable setting on your deck. Great choices for Vee's Note Card Party! they are perfect note cards! they say welcome.. relax with me! Yes, they are worthy...I'd love to send (or receive!) a note card with such a charming scene. I love your Adirondacks. And those red checked pillows? Perfect. Beautiful note cards for spring! I put my pillows out on my screened in porch and am hoping they stay nice and dry. We actually are getting rain here today. Gosh, this looks like such a relaxing spot! 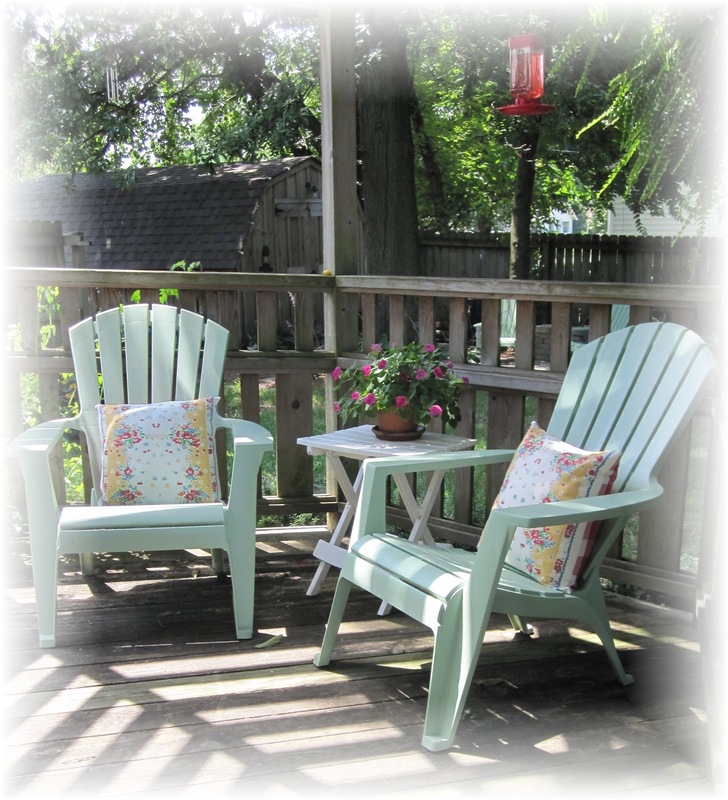 We'll be redoing our deck soon, and I just love your Adirondack chairs. So comfy! Thanks for sharing your photos - I love them all! Beautiful I am drooling at everything you have in your lil shop I think you will see me often!